So why is Messenger the best Voice of Customer solution for brick-and-mortar businesses? There is a new way to capture feedback in stores, restaurants and other brick-and-mortar businesses. 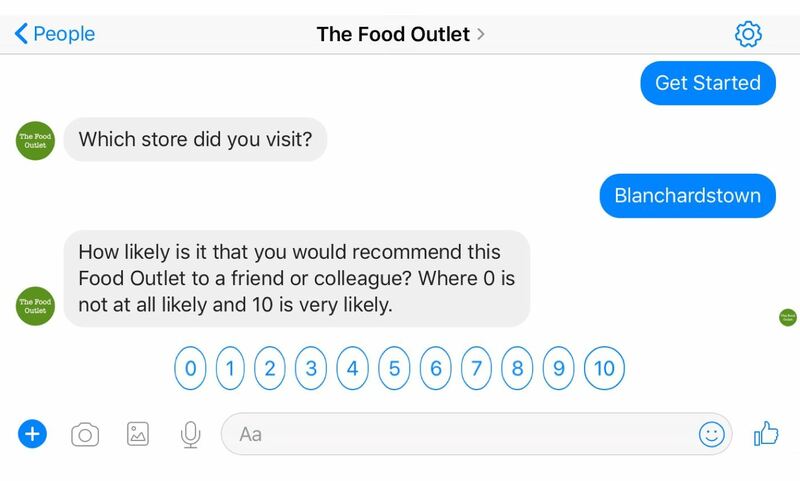 We recently launched a feedback solution that captures location-specific customer feedback via the messaging apps consumers love using, starting with Facebook Messenger. Messenger has nearly 150 million monthly active users in the USA alone (around 1.3 billion worldwide). It's the way consumers communicate with each other and they are comfortable using it. They also know they can easily block businesses who spam them. Messenger has built-in engagement tools that work very well in physical locations. Messenger Codes are similar to QR codes but with one key difference... they work seamlessly with the Messenger app. See the GIF below to see how they instantly start a conversational survey with our feedback bot. No typing long URLs here. Messaging apps were designed for the small screen and we only serve short surveys (max 10 questions) so there is no difficulty completing the survey in-store. Capturing feedback via messaging apps is new and people like to try novel things. Messaging surveys are delivered in a conversation like way; one question at a time. This is much more engaging than a long list of questions. Customers are only thinking about the question at hand rather than scanning the next 3 in the list. Messenger’s quick reply feature is much more engaging and flexible than radio buttons and beautifully facilitates asking questions like NPS, CSAT and more. Because the survey is delivered in a conversation like way, customers are more likely to provide meaningful free-form answers. Messaging lends itself to short interactive experiences. That’s why we keep our surveys short and include dynamic questions, which change based on the customer’s previous answer. Unlike practically every other channel where you have to capture a phone number or email address, on Messenger you are permanently connected to the customer (unless they block you or delete your conversation). Feedback is captured in real-time using messaging apps. Just think what that means. A customer finishes their meal and completes a survey. Before they have even stood up, your restaurant manager has received a notification and can see the profile picture of the customer. She arrives at the table just as the customer is leaving and turns a negative experience into a positive one. That is what the customer will be telling their friends about the next day at work. Not that their steak was overdone. Messaging is asynchronous, which means it can be live if both parties are available, but works equally well if messages are exchanged intermittently. That suits busy retail and restaurant environments. Your staff can message customers during off-peak periods without disturbing them (Messenger will send them a notification if turned on). On the other hand, ringing a customer creates the potential to exacerbate the negative experience if you catch them at a bad time. As I mentioned at the start, Messenger penetration is heading towards half the population of the USA, so no matter what the demographics of your customer base are, many of them will have Messenger on their phone (we also offer a web messenger option to those customers who do not use messaging apps). Whether you are a retailer, restaurateur or a service provider, customer experience is now a key battleground and messaging apps can play a central role in you beating the competition. As per usual, early adopters will benefit the most! To learn more and find out how ServiceDock’s dashboard displays feedback and uncovers customer insights, please get in touch.